NORRIDGEWOCK, Maine — John Daniel Williams, 29, the suspect in the shooting death of Somerset County Sheriff’s Deputy Cpl. 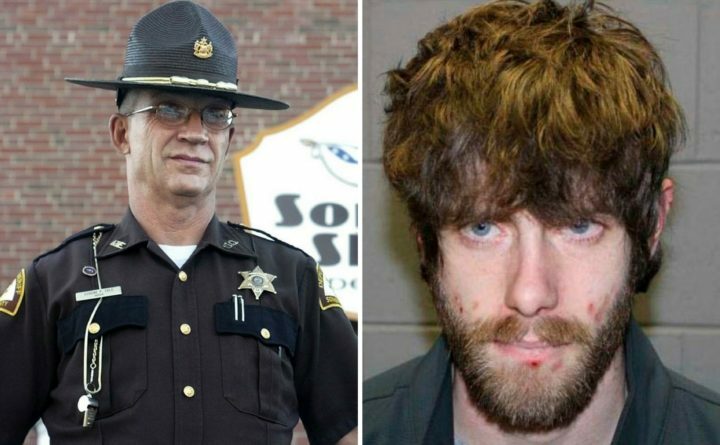 Eugene Cole, has been caught and is in custody, ending a four-day manhunt, Somerset County Sheriff Dale Lancaster said at a news conference just before 1 p.m. Saturday. The news came minutes after a noon news conference ended. The officers made contact with Williams at 12:43 p.m. and made an uneventful arrest in Fairfield near the Norridgewock border. A resident who lives across from 807 Norridgewock Road in Fairfield said he saw multiple police officers lead Williams, who was wearing only a yellow rain jacket tied around his waist, down a road from the woods past the address and into a red police car. The man, who asked not to be named, noted that address is “only a quarter mile through the woods” to the Martin Stream Road, which had been the focus of the search. The Maine Association of Police tweeted that Williams was put into Cpl. Cole’s handcuffs when he was arrested. Some 150 law enforcement officers on Saturday searched a 25-square-mile area centered along an old railroad track aside Martin Stream Road and the nearby woods in Fairfield and Norridgewock. It’s the same area they had been searching through Friday night. Lt. Dan Scott of the Maine Warden Service said at the noon news conference that the area was chosen based on the best information they’ve received of where Williams was likely to be. Scott said the cold, rainy and heavily wooded conditions had been challenging even for experienced outdoorsmen. He would not comment on whether or not Williams had preparedness training for such conditions. The search had been methodical and time-intensive because of the woods, weather and the presence of camps and out-buildings in the area. It has also transformed the face of this rural town in the middle of Maine. For residents there, Saturday’s arrest came as a great relief. “My kids can go outside now,” Susan LePage, who lives on Upper Main Street across from where police set up a central command post at the town fire department, said Saturday afternoon. “I don’t have to worry about anyone anymore — they’re safe,” she said. When the news of Williams’ capture broke, LePage stood with family in her front yard and cheered on law enforcement officers as they drove by. “Thank you so much for being there,” she shouted. “I’m just so glad it’s all done,” said her sister-in-law Devon LePage, 38. Police officers in two patrol cars passing each other near the command post also rolled down their windows and high-fived each other. Their exuberance rushed through the state quickly. A driver heading south on Interstate 95 saw the words “It’s over. Thank you law officials,” displayed on a digital highway sign near the Orono-Bangor border. During the noon press conference, Cpl. Cole’s widow, Sheryl, made a plea to Williams through Somerset County Sheriff Dale Lancaster to turn himself in, or at least contact law enforcement. “Please, please talk to us,” she said. With the suspect still on the loose Friday and early Saturday, safety concerns had prompted some events to be changed. Saturday night’s pro-am boxing card, originally scheduled at the Skowhegan Community Center, has been moved to nearby Skowhegan Area High School. The community center was being used as a staging area in the search for Williams. Gov. LePage on Friday issued an emergency proclamation suspending all hunting in parts of Norridgewock, Skowhegan and Fairfield until further notice. That includes youth wild turkey hunting day, which was scheduled to start Saturday, and regular turkey season, to start Monday. It was unclear Saturday if the order would be rescinded in time for the season to begin in those towns as planned. Police had offered a $20,000 reward for information leading to Williams’ arrest. BDN writers Alex Acquisto, Callie Ferguson and Ernie Clark contributed to this report.